One of the defining features of the Rubicon equipment package on the Wrangler is the differential locker that Jeep installs in each axle. 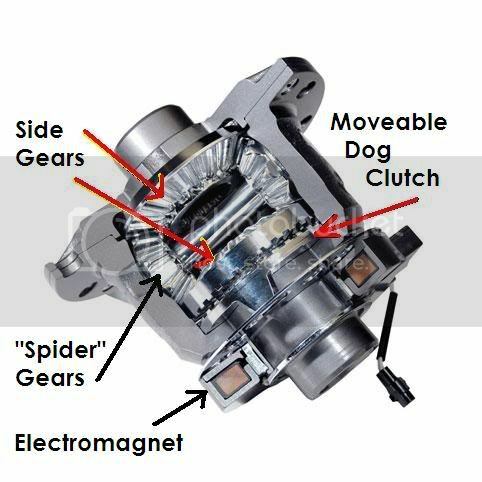 A locking differential is a variation on the standard automotive differential; it provides increased traction compared to a standard "open" differential by preventing wheel speed differentiation between two wheels on the same axle. It essentially "locks" both wheels on an axle together as if on a common shaft. This forces both wheels to turn in unison, regardless of the traction (or lack thereof) available to either wheel individually. An open differential will cease the transmission of torque to one wheel if the opposite wheel has little or no traction. This may occur if one wheel comes into contact with mud, snow, or ice, or if the wheel is somehow removed from contact with the road after encountering an obstacle or area of soft ground. In such a situation, an open differential will continue to spin the wheel with the least amount of traction but will transmit little or no power to the wheel that has more solid traction. Basically, it will transmit only as much torque to both wheels as the wheel with the least amount of traction can sustain. This can result in the vehicle failing to deliver enough torque to the drive wheels to keep the vehicle moving forward, at which point it will be stuck. A locking differential solves this problem with its capability of delivering 100% of available torque to the wheel with the most traction. However, a locking differential must be able to unlock for street use, however, because the tires need to be allowed to rotate at different speeds when it is required (such as when negotiating a turn). Most automatic lockers (such as the Detroit Locker) work flawlessly off-road, but their operation on-road creates several handling quirks along with periodic clunking and banging.